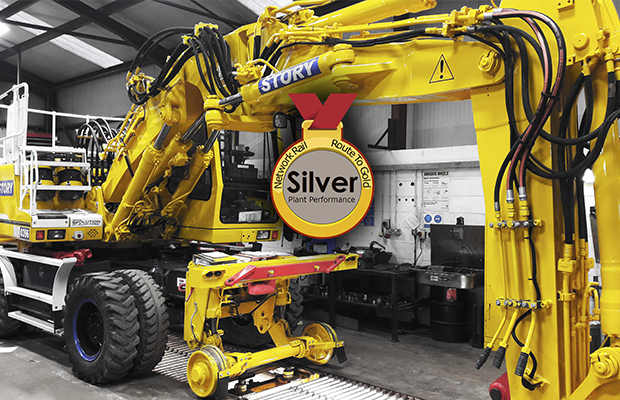 Story Contracting were recently presented with the Silver Plant Reliability Award on Network Rail’s Route to Gold scheme, becoming one of only two suppliers in the UK to receive the accolade. The award was presented as a result of Story’s ongoing commitment and performance to Network Rail’s RPP (Rail Plant Performance) System. Story’s Plant Maintenance Manager, James Haile, accepted the award on behalf of the Plant Department, with Network Rail praising Story’s honesty, root cause analysis, reporting and willingness to share. This is a fantastic achievement for everyone involved from all 3 depots (Carlisle, Bonnyrigg and Normanton), but especially for the maintenance teams who are working to achieve 100% Plant reliability on a daily basis.